Have you run out of business cards and need some new ones for a meeting tomorrow? A new title? Or started a new job and need to call on clients? Flying out tonight? Get your new business cards printed today. Pick up in store same day or we will deliver next working day Australia wide to metropolitan areas. It is important to make a good first impression when you meet a new client. Your business card communicates to your customers the importance that you place on your companies image, and therefore the products and services that you provide or deliver. Market research shows that quality business cards will have a positive effect on how clients view your company and how you operate in business. At fprint we can help you design and print a business card that will send a clear message to your clients about your level of professionalism. Contact us for a quote on setting up your business card today, call 1300 70 80 28 or email orders@fprint.com.au. Our Express Business cards are printed on 350gsm heavy weight card. Print fifty, one hundred or two hundered. 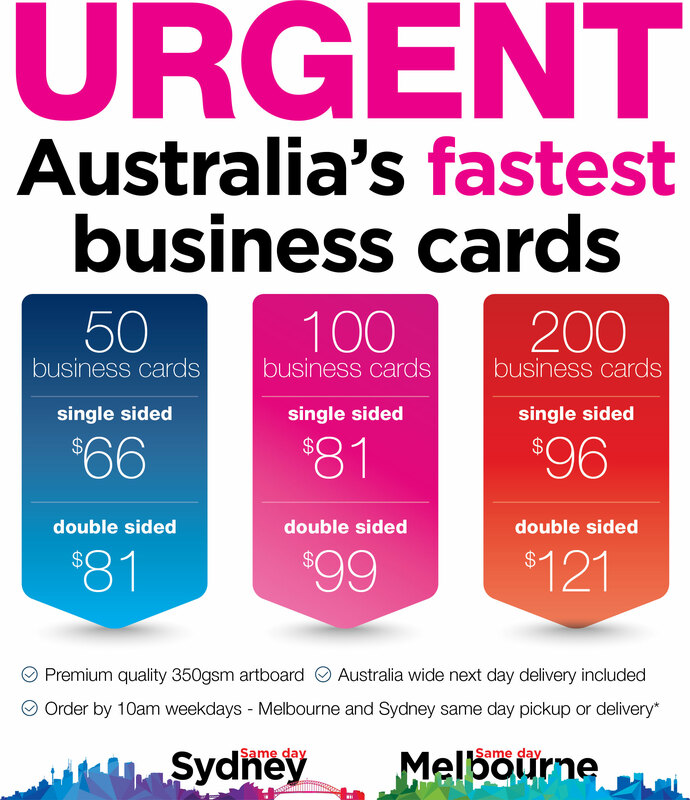 You can now get you business cards fast, delivered next working day with fprint Express Cards. If you need a business card setup created, our designers can help. Whether it's a simple text layout or a fully developed concept through to finished art, call us on 1300 70 80 28 to find out what we can do to help. Fprint setup and printed our new business cards inside 24hrs, so we picked them up on the way through to the trade show/conference that we needed them for. Thank you fprint. Thanks fprint for delivering great business cards at a great price on the same day. Service was fantastic.